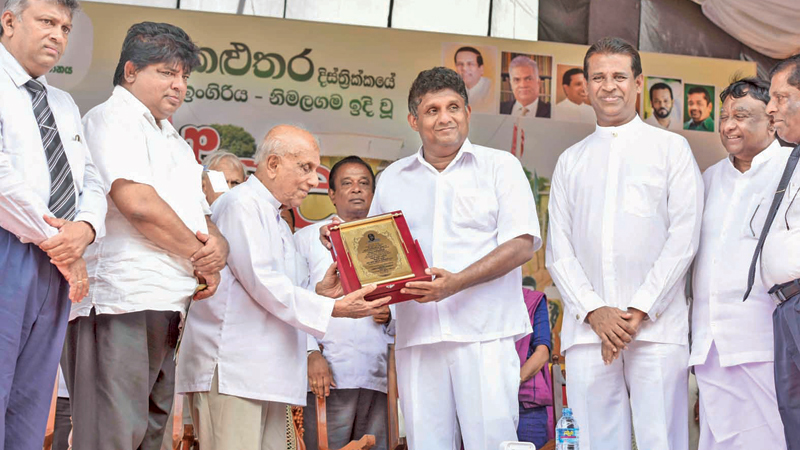 Minister Sajith Premadasa presents a memento to former Minister Indradasa Hettiarachchi after whom the model village is named. When the government is engaged in an honest job of work to ensure the future welfare of the people, a small coterie of opponents was trying to obstruct it by creating a fear psychosis and investing non-existent ghosts from time to time, Housing, Construction and Cultural Affairs Minister Sajith Premadasa said. Their sole aim is to send their former masters back to high office and engage in their former agendas relating to private business deals, he said. But the government will never allow bribery, corruption, terror and dictatorship to raise its head once again in the country, the Minister said. He was speaking at the opening of Indradasa Hettiarachchigama model village in Nimalagama, Ingiriya, recently. This is the 158th village built under the Ministry’s reawakened villages programme. Minister Premadasa said the government’s objective was to complete 2,500 reawakened villages in the country by the end of September. Work had already been started on 1,684 villages and they had to build another 816 model villages to achieve that target. The final objective of the government was to achieve a target of 20,000 model villages by 2025. Minister Premadasa said when he was engaged in selfless service without enjoying even the privileges entitled to a Minister such as salary, official residence and official vehicle, critics alleged that he wasted public money on tamashas. His father, late President Ranasinghe Premadasa, too faced such unfounded allegations when he donated the Ran Viyana to the Sacred Tooth Relic in Kandy. When his Ministry was building houses for the homeless, the government had implemented the Moragahakanda and Kalu Ganga projects, built roads and school buildings and reduced prices of essential drugs by nearly 70 percent. But these salutary acts did not gain much publicity. His officials were working day and night without concern for their private lives to help achieve the target of 20,000 model villages in the country. He said the 27 beneficiary families in Indradasa Hettiarachchigama received plots of land free to build their houses with assistance from the NHDA. Indradasa Hettiarachchi was a renowned social worker who worked closely with late Presidents J.R. Jayewardene and Ranasinghe Premadasa.